‘Children of the Revolution’ will air around Texas and may go national. Advertising pioneer turned documentarian Lionel Sosa, who produced the KLRN series “The Children of the Revolution,” is reaching a wider audience for the 20-part series first aired in San Antonio last fall. Already being carried by several PBS stations in Texas, the series will air in January on all but one of them. National distribution is being discussed with two major networks for the 2012 season, KLRN’s CEO Bill Moll said. 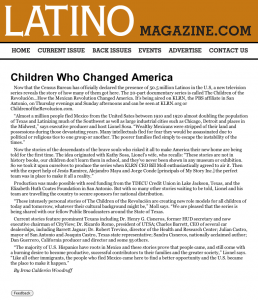 Children of the Revolución in the latest edition of Latino Magazine. Now that the Census Bureau has officially declared the presence of 50.5 million Latinos in the U.S, a new television series reveals the story of how many of them got here….